The African Rock Python is native to the Sub Saharan Africa. The python has seven species and African rock python is one of them. They are non venomous snakes and are the largest snakes in Africa. The name Python Sebae was derived from the Greek mythology, which refers to a huge serpent. 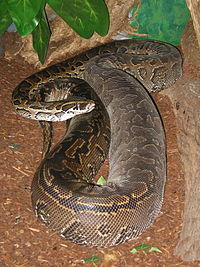 African Rock Python is amongst the seven species of python. They have two sub-species of African Rock Python, one of which are found in the Southern Africa which are also called Python Sebae Natalis and the other types are found in the Western and Central parts of Africa. The African Rock Python found in the Central and Western Africa was identified by a German naturalist Johann Friedrich Gmelin in the year 1788. The Python Sebae Natalis found on the southern Africa were identified by the father of South African Zoology, Sir Andrew Smith in 1833. The largest snake in Africa and the third largest snake in the world, it’s enormous and bulky. They can weigh up to 135kgs. An average male African Rock Python measures around 16 feet however the largest that has been confirmed are around 20 feet long. The females are larger than the males. However they vary according to the place. 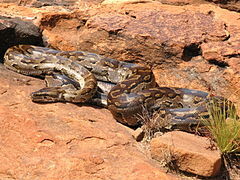 Places of higher populated has recorded smaller size African Rock Python than the ones with lesser population. It has a very thick body with blotches which are joined like irregular stripes and ultimately fade to white underneath. Their body color varies between brown, chestnut to olive. They have a triangular dark arrow head shaped head. They have a triangular mark below their eyes. Smooth and dry to touch, their scales are small and smooth. The African Rock Python have these heat sensitive pits around their lips which help them to detect warm blooded preys. The African Rock Python are usually found on the open savanna, grassland, rocky area, forest and semi deserts type of habitat. They are dependent on water soften found near the water bodies like lakes, swamps and marshy areas, they become dormant during the dry season. They occupy the abandoned ant bear burrows or under the dense pile of driftwood. 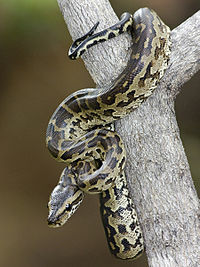 The African Python is found throughout the Sub-Saharan Africa. They are found from Guinea and Senegal on the western coast of Africa, spreading across the central Africa and also towards the east coast of Ethiopia, Southern Somalia, towards Kenya and northern Tanzania. African Rock Python were found at Florida Everglades in the year 2009. African Rock Python becomes sexually active at 3 to 5 years old. They reproduce during the spring. They lay about 20 to 100 eggs. The incubation period last for around 2 to 3 months during which the female guard their eggs aggressively against any predators. The length of the hatchlings is around 18 to 24 inches. African Rock Python can live up to 12 years in wild however they can live up to 30 years in captivity. The African Rock Python are carnivorous and non venomous; therefore they coil around their prey and constrict them. The prey ultimately dies due to cardiac arrest. They hold a tight grip and tighten it every time the prey breathes out. They swallow the entire prey and if the prey is big enough they can do without eating for almost a year. They can swallow up to 60 kilo grams of lifeless prey. Since their upper and lower jaws are attached together and their ligament stretches they have the ability to swallow preys bigger than themselves. They have strong acids inside their stomach which helps them to digest their food. The African Rock Python feeds on rodents, small and medium antelopes, monkeys, domestic pigs, lizards, dogs, goats, crocodiles and at times even fishes. African rock Python snake does not have many predators. Humans are their main predators and in some cases they might be a prey to hyenas or the African wild dogs during their digestion period. African Rock Python are available at exotic pet shops. Their prices vary according to the color of their skin and their temperament. They can be breed in captivity however are not meant for beginners. They are large and aggressive especially when they are hungry or when they guard their eggs. Their species and taxonomy has been described differently by various authors. African Rock Pythons are not endangered species but are listed as the CITES (Convention on International Trade in Endangered Species) appendix 2 species as their skin are in demand for making leather, belts and bags. Exporting them is restricted. During the breeding season both the sexes fast and the female African Rock Python continues the fast till the eggs are hatched. The hatchlings have to fend for themselves. African Rock Pythons feeds only once or twice a month and if their prey is big enough they can go without food for almost a year. Burmese Python had been thriving in Florida where they don’t have many invasive species. 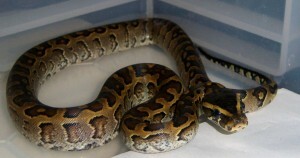 Since 2002 six African Rock Pythons, were located on the loose in Florida. This was a matter of great concern as some of the scientist feared that the African Rock Python would breed with the Burmese Python and the out spring would be a more aggressive species of super snake. It would not only hamper the ecosystem but would also be dangerous for families with small children. African Rock Python have known to attack livestock and pets of human beings. They feed on dogs, goats and cattle which are important source of livelihood of the local residents. There are reports of the African Rock Python attacking human beings too but they usually do not attack unless they are provoked. They can cause threat to families with small children. African Rock Python conservation is not a matter of very big concern however they are no longer widespread like the earlier times. The reason for their decline is mainly due to hunting for their skin or meat. They are mainly restricted to secluded areas, hunting reserves and parks. They are listed as on appendix 2 of CITES (Conservation on International Trade of Endangered Species) and hence has been legally protected especially in areas where their species are vulnerable and declining. Here are some amazing images of the largest snakes in Africa. why is Miami Dade county finding all those African Rock pythons and they said very deadly and are poison. Are these cross breed with other snakes in Florida.